With a stay at Eco Resort Chalés San Thomaz in Belmiro Braga, you'll be on a lake, and 16.1 mi (25.9 km) from Saint Anthony of Paiol Farm and 19.4 mi (31.2 km) from Capitao Pitaluga Museum. The front desk is staffed during limited hours. Event facilities at this resort consist of a conference center and meeting rooms. Free self parking is available onsite. 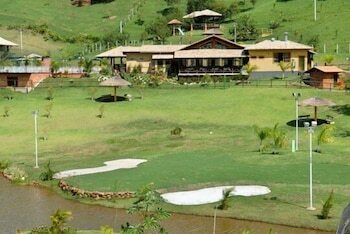 When you stay at Pousada Casarão de Minas in Sao Lourenco, you'll be within a 10-minute drive of Kart Center and Aguas de Sao Lourenco Park. Free self parking is available onsite.